Rev. Fr. Lawrence Ogundipe was born on August 12 , 1978 at Ijebu Isagamu in the western part of Nigeria to the family of Prince James Ogundipe. He is an indigene of Imeko-Afon Local Government Area, in Ogun State. The second child of the family of four; comprising three sons and a daughter. At 5, Fr. Ogun as he was fondly called began his educational pursuit in St. Peter primary school Ota, Ogun State. However, between 1990 and 1995, he attended Anglican Grammar school in Ota and then later, Government Technical College, Ikotun-Egbe, in Lagos State. In the spirit of being entrepreneural, Fr. Ogun obtained a Diploma in plumbing and pipe-fitting between 1996 and 1999; and further engaged himself in learning Theatre Arts as a director, script writer and cinematographer. It is interesting to note that, Fr.Ogun is a recognized member of the following association, namely The Scout Nigeria, pioneer member of Awori 3 Company, Boys’ Brigade Corps, NACAN (National Association of Christian Artist of Nigeria), NACATHS (National Association of Catholic Theology Students), ANTP (Association of Nigerian Theatre Practitioners. He has also featured in the following films: Ida-Isegun, Oyin Kikan, Taladajo, Ade ola-Onibepe-Oru, Deceptive Games, Who is responsible? Just a Hug and other likes. Furthermore, Fr. Ogun is also the Graphic Manager of the Vocationist Search Magazine(s), the Production Manager of NACATH Journal of African Theology. As a writer, he has authored “Let us pray with St. Lawrence”. He worked for few years at Unique pharmaceuticals company then became the executive director of Blue dreams concept. He is a creative man of our epoch who believed strongly that man will travel in waves someday as a means of transportation. As a dynamic fellow, Fr. Ogundipe had an enriching and inspiring spiritual foundation. His father, a member of African Methodist Church baptized him with the name Samuel. This was in the fulfillment of the father’s promise to offer one his sons to God. But owing to his conversion into the catholic faith, he received again the name Lawrence on December 31 , 1985. This was followed by the reception of First Holy Communion and Confirmation in 1986 and 1994 respectively. Interestingly, these spiritual foundational experiences were the bedrock of Fr. Ogun’s sincere zeal and interest to the catholic priesthood. And in the spirit of discerning this vocation which he discovered, he took the Most Holy Mary as his grandmother. Little wonder some of his friends call him “the grandson of Mary”. Hence, this ardent devotion to Our Lady was further cemented with his consecration to God as a slave through Mary in the Confraternity of our Lady, Queen of all heart. It is worthy to note however that at a point in his spiritual journey, his zeal for the Priesthood started to dwindle but thanks to God who re-enkindled in him the fire of His love as a result of his encounter with a Vocationist priest, which led to his admission into the Vocationist Fathers and Brothers in 2005. On January 18, 2006, Fr. began his postulancy in the Mother House of the Vocationist Fathers and Brothers, in Oparanadim, Mbaise, Imo State. 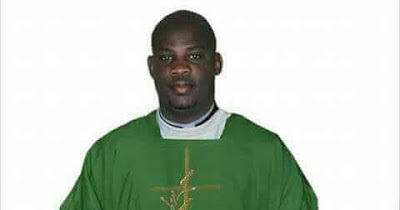 And having completed his one year canonical novitiate in the same place, which he was admitted to on August 27, 2007, Fr.Ogun received his First vow as a religious on August 28 , 2008. In the pursuit and fulfillment of his priestly academic formation, Rev. Fr. Ogun obtained B.A Hons Philosophy from Saints Peter and Paul Major Seminary, Ibadan; in affiliation to the University of Ibadan in the year 2011. But before he commenced his studies in theology, he received his Last religious vow as a Vocationist in 2012. However, having being soaked in the depths of catholic theology at the Domican Institute, Samonda, Ibadan; Fr. Ogun received B.Th from St. Thomas Aquinas Pontifical University (Angelicum), Rome. So, in the spirit of service to God in humanity and as a part of the prerequisite for seminary training, Rev. Fr. Lawrence Ogundipe had his pastoral and apaostolic work experiences in the following ecclesiastical jurisdictions: Justin Russollilo's Vocationary Ibadan :2008- 2009,Assumta Cathedral Owerri Arch-Diocese 2010; SS Jude & Anthony Umbaukwu Akwa Diocese-2013; St. Dominic Catholic Church Afara Owerri Arch-Diocese -2015. Rev. Fr. Law was admitted into the minor ministry of Lector and Acolyte in the years 2013 and 2014 respectively. He was ordained a Catholic Deacon on October, 25th, 2014. And as it pleases God he is a priest of God in the order of Melchizedek. Currently ministering to the needs of the children of God in Abeokuta Diocese Nigeria.